Businesses attract and retain the best talent. Employees have access to workplace benefits that support their family, especially their children’s healthy development. Our next generation workforce has the skills and knowledge to succeed. At the Family Forward NC Summit, we will explore how to achieve this vision by supporting and inspiring employers across the state to increase access to research-based, family-friendly practices—big and small—that improve workplace productivity, recruitment and retention; grow a strong economy; and support children’s healthy development. The Family Forward NC Summit is for employers and business and community leaders who want to attract and retain top talent, support child health and well-being, help close the skills gap and support future workforce development. Participants will leave with the knowledge and tools to start or continue conversation and action about benefits within their own organization. 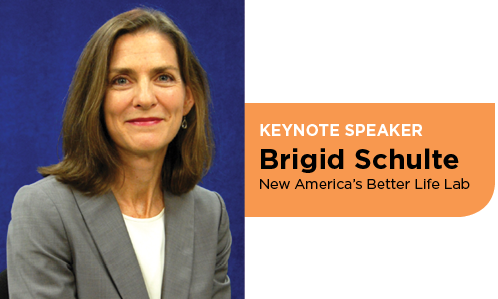 Brigid Schulte is an award-winning writer and journalist and director of The Better Life Lab and Good Life Initiative at New America, a nonpartisan think tank in Washington DC. The Lab uses the power of data, transparency and storytelling to redesign work so that it’s sustainable, effective and fair; reimagine gender equality for a fairer, more human future; and rewire social policy to meet the needs of diverse 21st century families. Schulte was a staff writer for The Washington Postand Washington Post magazine for nearly 17 years and was part of a team that won the Pulitzer Prize. She lives in Alexandria, Virginia with her husband and two children. She is the author of the New York Times bestselling book on time pressure, Overwhelmed: Work, Love & Play when No One has the Time. Mary-Ann Baldwin has spent over 30 years in communications, business development, marketing, and branding. She is currently the Vice President of Marketing and Business Development at Raleigh’s Holt Brothers Inc., founded by former NFL players Terrence and Torry Holt, and the Executive Director of the Holt Brothers Foundation. Baldwin’s diverse background includes stints at Stewart Engineering, Mulkey Engineers & Consultants, the NHL Carolina Hurricanes, William Mullins and the Raleigh Chamber of Commerce, as well as the founder of her own firm, Baldwin Communications. She served as an at-large City Councilor in Raleigh for 10 years, and is the co-founder of Innovate Raleigh, a nonprofit committed to making our region the top center for innovation and entrepreneurship in the nation. Anita Brown-Graham directs ncIMPACT, a special initiative at the University of North Carolina School of Government. Through ncIMPACT, Graham helps local governments use data to address complex challenges found in North Carolina Communities. Previously, Graham served as the director of the Institute for Emerging Issues (IEI), where she worked to build North Carolina’s capacity for economic development and prosperity. Brown-Graham is a William C. Friday Fellow, an American Marshall Fellow, and an Eisenhower Fellow. In 2013, the White House named her a Champion of Change for her work at IEI, and the Triangle Business Journal named her a 2014 Woman in Business for her policy leadership in the state and a 2017 CEO of the year. Patrick Conway is the President and CEO of Blue Cross and Blue Shield of North Carolina. Conway most recently served as Deputy Administrator for Innovation and Quality at the federal Centers for Medicare and Medicaid Services (CMS) and Director of the Center for Medicare and Medicaid Innovation (CMMI). As the most senior non-political leader at CMS, he worked in both Republican and Democratic administrations and is considered one of the driving forces behind the national movement to value-based care, with health care payments tied to quality and innovation. A respected leader, innovator and clinician, Conway was elected to the National Academy of Medicine (NAM) in 2014. Election to the NAM is considered one of the highest honors in the fields of health and medicine. Conway is a practicing pediatric hospitalist and was selected as a master of hospital medicine from the Society of Hospital Medicine. Jennifer Jordan is the founder of Aeroflow Breastpumps and the director of the Mom & Baby division at Aeroflow Healthcare, an Asheville-based durable medical equipment provider that has helped hundreds of thousands of women to receive a breast pump through insurance. As a mom who breastfed, she is passionate about supporting and encouraging all moms on their breastfeeding journey. At Aeroflow, Jordan has been involved in the creation of a pumping suite on the Aeroflow campus, as well as the implementation family-friendly benefits such as expanded parental leave and paid Doula services. As a result, Aeroflow Healthcare has been certified by the North Carolina Breastfeeding Coalition as a Breastfeeding-Friendly Workplace. Lisa May is the executive vice president of human resources of RTI International, leading the department as a member of the executive leadership team and advising on human resources strategies, policies and practices, and key people-related initiatives. She has more than 25 years of experience in strategic human resource management, with demonstrated expertise in talent acquisition, leadership development, executive coaching, and organizational design. Prior to joining RTI, May was the head of human resources for AAIPharma Services Corporation and Cambridge Major Laboratories. Previously, she served as the vice president of HR for the Global Operations organization at Hospira, Inc. The Family Forward Summit will be held at RTI (3040 East Cornwallis Road, Durham) in the Horizon building. There will be event signs and marked cones to direct you. A map of the campus can be found here - follow the red dotted line. Please enter from East Institute Road, buzz in at the gate and tell security that you are here for a special event in the Horizon building. Park in the adjacent deck. Once inside the main lobby, you will be greeted and escorted to the meeting room.